Bluehost CRAZY Cyber Monday Limited Time Discount 2.95$/Month! Bluehost is here with the best cyber Monday deals of all time with hosting solutions far better than other web hosting companies out there. If you've been reading a lot about blogging and it's success stories lately and planned to start your own blog, this is the perfect time for you to do so. Cyber Monday sale comes only once an year, and these rates couldn't get any lower, so I would recommend you to grab a hosting account with Bluehost on this coming Monday InshaAllah. Briefly, Bluehost is one of the best website/blog hosting companies out there where you can install WordPress (A very popular blogging platform) with a single click. The companies takes care of everything on your part like, it provides you with unlimited unlimited bandwidth so that you can drive as much readers on your blog as you wish and without crashing your blog due to tons of readership. Along with that, Bluehost provides you with unlimited storage and an extremely user friendly cPanel that you would hardly get anywhere else. In an all, Bluehost are the leaders in web hosting around the world and this is just the perfect time to get on board with them by starting your blog at the lowest possible rates. If you sign up now, you'll be able to get an hosting account at 2.95$ per month, which is in all honestly a steal from a company of this caliber. Note that this is a single time offer in a calendar year, so don't miss this chance! I've listed down the FAQs and Steps that you need to take to get this offer and signup for your first ever web hosting. When Is This Discount Starting? You can get Bluehost hosting at 2.95$ per Month after 1‌2:0‌1am on November 30‌th MT) which becomes like about 7 hours after this post gets live. For now, the rate is shown at 3.25$ per Month. Keep coming back until the rate becomes 2.95$. Once it drops to that, get it as early as possible as you won't get any deal better than this for the rest of the year! 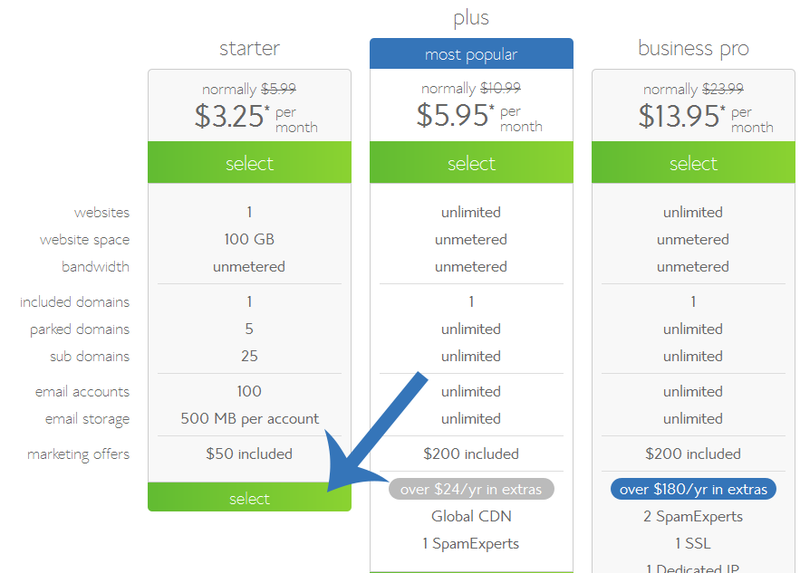 If you act on this massive sale, you tend to save about 40-50$ depending upon the package/hosting plan you pickup. Which is like 30-40% off! How To Get This Bluehost Hosting At Such a Low Price? Click on Get Started Now as shown in the image below. 2- Choose the Starter Plan as shown in the image below. The starter plan is more than enough for you to get started. It's the cheapest plan Bluehost has and offers you unlimited traffic bandwidth, which means you can drive as much traffic as you wish on your blog without having any tension of site down time. You're good to go. This is what I personally use for my sub domains too. 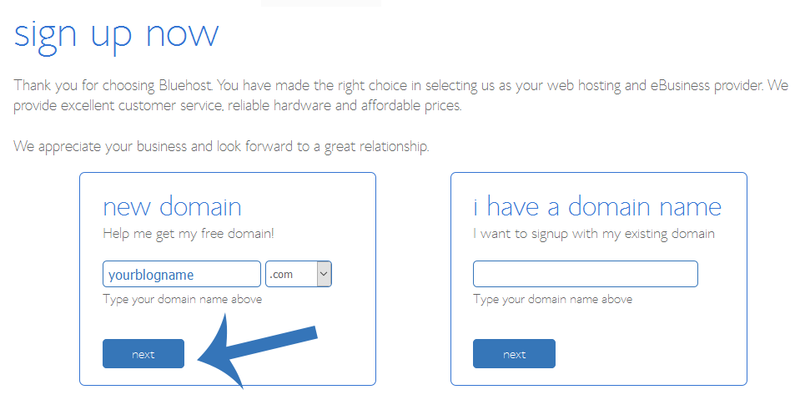 Now you have to enter a domain name (like bloggingehow.com in my case) of your new blog. 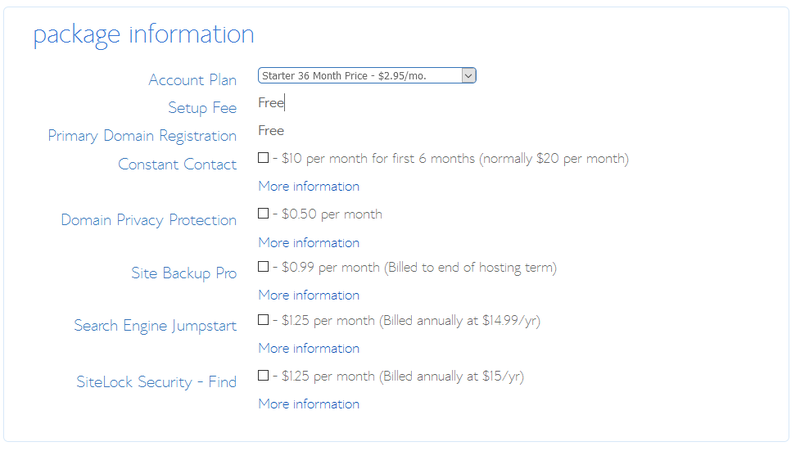 Bluehost offers this one domain name totally free with web hosting, so that you can get started as quickly as possibly. Make sure that you uncheck all the boxes as shown in the image above. These are extra offers that you don't want at the beginning. They are just addons that would cost you extra. NOTE: This 36 months package, which is 3 years, will save you the most amount and is recommended when it comes to search engine optimization too. Google prefers to rank websites and blogs higher that are registered for longer period of time, that is more than 1 year. This statement from them clearly shows that you should register your domain for 3 years. And what could be a better opportunity then this Cyber Monday Deal! Once you've entered your registration details, simply checkout via credit card or you can pay with Paypal too. BloggingeHow | Making Blogging Simpler: Bluehost CRAZY Cyber Monday Limited Time Discount 2.95$/Month!